Professor Sir Paul Curran’s report adds an independent voice to the debate about seven-day-a-week healthcare services. Seven-day-a-week healthcare services are currently the subject of intense debate in England. 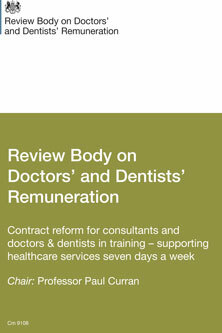 The UK Government asked its Pay Review Body, chaired by Professor Sir Paul Curran, to provide independent advice on how contract reform might support the delivery of seven-day services. Written and oral evidence was collected during the winter and spring and the Report was published and laid before Parliament on Thursday 16th July. You can read the report on the government website. Publication was launched by a Statement to the House of Commons. The Report found the case for expanded seven-day services in the NHS, in order to address the weekend effect on patient outcomes to be compelling. It supported contractual reform and provided a roadmap to support further contract negotiations.